The American Diabetes Association is launching The Asian Flavors Diabetes Cookbook this June. 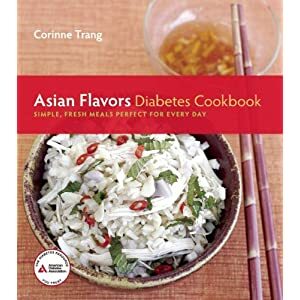 Written by award-winning author Corrine Trang, it aims to make diabetes meal planning easy for everyone. It's the first book that takes the elegant, easy-to-prepare, and naturally healthy recipes and meals of Asian cuisine and crafts them specifically for people who need to follow specific eating plans. A compendium of comfort foods from all over Asia, Trang updates classic recipes from Chinese, Japanese, Korean, and Southeast Asian cuisines to make them work for the health-conscious cook who wants to put healthy, delicious meals on the table. I'm particularly excited about this book because I'm Asian and a lot of diabetes cookbooks in the market today feature recipes that we don't usually serve at the dinner table. Not to mention that we don't have much of their ingredients here in the Philippines. Also, Asian food has a flavor of it's own that we don't usually taste from other regional fare. As Tang writes, "In the kitchen, we’re constantly exploring textures and colors. We play with flavor profiles that include sour, bitter, salty, sweet, and spicy notes—the essence of good food. Applying these characteristics to a wide variety of vegetables, fruit, seafood, and meats is part of a centuries-old tradition." I agree! With 110 recipes, Trang treats readers to delicious soups; finger foods; rice, noodles, and crepes; vegetable sides; seafood; meat and poultry; sweets; as well as more than a dozen sauces and dressings. Focusing on healthy cooking techniques, such as steaming, stir-frying, braising, and grilling, Trang explores a myriad of delicious, balanced dishes that bring together body, mind, and spirit, including Chicken Satay, Stir-Fried Sushi Rice with Shitakes and Garlic, Tofu Teriyaki, Mussels in Sake Sauce, and Miso-Marinated Beef Tenderloin. There are even desserts! Treat yourself to such sweet endings as Sticky Rice with Mango and Coconut Sauce and Almond Tapioca with Banana and Corn. To make diabetes meal planning as easy as possible, each recipe includes complete nutrition information, including calories, calories from fat, total fat, saturated fat, trans fat, cholesterol, sodium, potassium, total carbohydrates, dietary fiber, sugars, and protein, as well as exchange values. Corinne Trang is the award-winning author of several books, including Noodles Every Day, Curry Cuisine, The Asian Grill, A Food Lover’s Companion: Vietnamese, Essentials of Asian Cuisine, and Authentic Vietnamese Cooking. Dubbed the “Julia Child of Asian Cuisine” by theWashington Post, she has been a guest on numerous shows, including NBC’s Today Show, The Martha Stewart Show, CBS News, ABC News, Fox News, and Bloomberg Radio. Her articles have appeared in Saveur, Food & Wine, Relish, Cooking Light, Fine Cooking, Gourmet, Islands,and Bon Appétit. The American Diabetes Association is leading the fight to STOP DIABETES® and its deadly consequences for those affected by diabetes. The Association funds research to prevent cure and manage diabetes; delivers services to hundreds of communities; provides objective and credible information; and gives voice to those denied their rights because of diabetes. Founded in 1940, its mission is to prevent and cure diabetes and to improve the lives of all people affected by diabetes. For more information please call the American Diabetes Association at 1-800-DIABETES (1-800-342-2383) or visit www.diabetes.org. Information from both of these sources is available in English and Spanish.